For a unique and special gift that she will want to wear every day, this beautiful Your Birthstones Inside Heart Ring in white gold from Apples of Gold Jewelry is a wonderful and creative piece that will allow her to wear any birthstones in a ring! 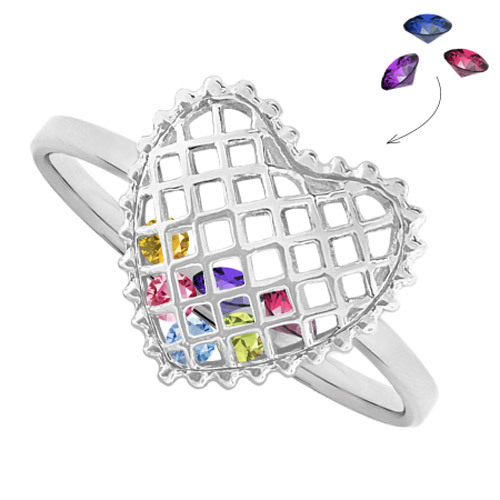 Available in your choice of 10K or 14K white gold, the lattice like heart on the white gold band will show off your choice of genuine or simulated gemstones inside. The gemstones are 3mm in size and round cut, and you can select up to 8 gemstones to go inside the heart. This is a great idea for mothers - add the parents' birthstones as well as the children's' birthstones, or just the children's' birthstones, to give her a special piece of jewelry she will cherish always. We guarantee our Your Birthstones Inside Heart Ring in White Gold to be high quality, authentic jewelry, as described above.